Manchester City’s influential duo Sergio Aguero and Kevin De Bruyne are in contention to face Everton at home in the Premier League on Saturday, as they look to rebound from their first domestic defeat of the season last weekend. 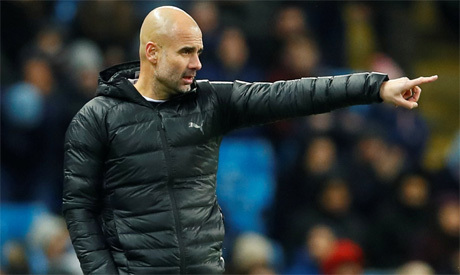 City boss Pep Guardiola told a news conference on Friday that both players had come through training this week unscathed and might feature against a side City have not beaten at home in the last two seasons. “He (Aguero) did the last two training sessions. On Thursday, he trained with the team. He has no pain and we will decide,” Guardiola said. Ahead of a packed festive schedule with six games in the space of 20 days, City’s squad may be stretched with David Silva, Danilo, Benjamin Mendy and Claudio Bravo all sidelined. Defender John Stones was forced off in City’s 2-1 win over Hoffenheim in the Champions League on Wednesday and his fitness will be assessed ahead of the weekend. “No, we are not going to sign anyone,” he said of his second-placed side, who sit one point behind unbeaten leaders Liverpool. They will reclaim top spot for at least 24 hours by securing a point against Everton, with Liverpool playing City’s rivals Manchester United on Sunday. “We make good games but we didn’t win, we dropped four points,” the Spaniard said. “Tomorrow is another game, the Everton team has changed completely with (Gylfi) Sigurdsson and Richarlison, (Lucas) Digne and Yerry Mina - it is a top side. Their task will be made easier should the club’s record goalscorer Aguero return to the line-up.